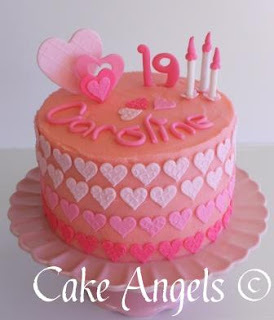 Pink Hearts were the order of the day for this lovely young lady who was celebrating her 19th Birthday. Luscious Lemon was the flavour and we are told that she was so delighted with her Cake that she didn't want to cut it, wishing she could put it in a glass case and look at it forever. Such lovely compliments for the Cake Angels.